With a t r a d i t i o n a l crash of champagne against its hull, a 258-foot hydro-dump barge was launched recently by the Marine and Rail Equipment Division of FMC Corporation, Portland, Ore. The barge (shown above) was christened by Marge Dolle, wife of Henry Dolle, a recently retired employee of Smith-Rice Company, a dredging business based in San Francisco, Calif. Smith-Rice purchased the barge for transporting and dumping dredge material in the San Francisco Bay region. 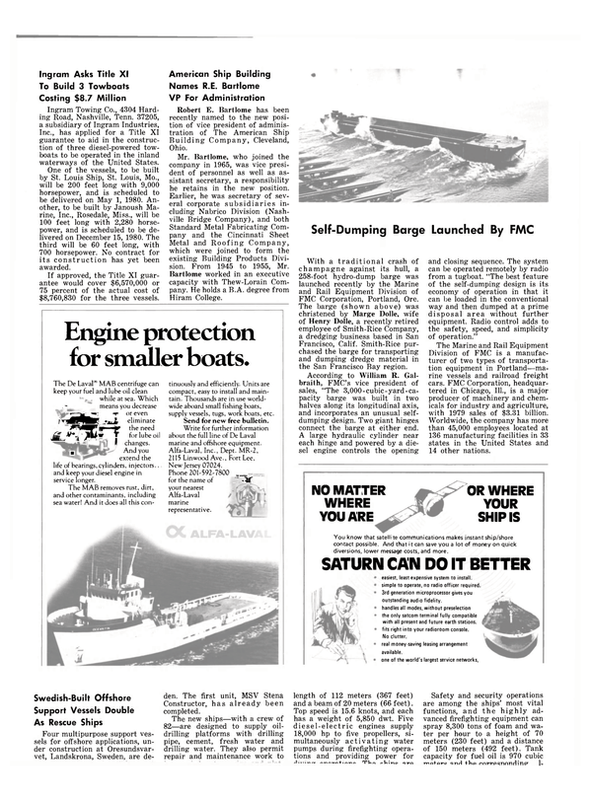 According to William R. Galbraith, FMC's vice president of sales, "The 3,000-cubic-yard-capacity barge was built in two halves along its longitudinal axis, and incorporates an unusual selfdumping design. Two giant hinges connect the barge at either end. A large hydraulic cylinder near each hinge and powered by a diesel engine controls the opening and closing sequence. The system can be operated remotely by radio from a tugboat. "The best feature of the self-dumping design is its economy of operation in that it can be loaded in the conventional way and then dumped at a prime disposal area without further equipment. Radio control adds to the safety, speed, and simplicity of operation." The Marine and Rail Equipment Division of FMC is a manufacturer of two types of transportation equipment in Portland—marine vessels and railroad freight cars. FMC Corporation, headquartered in Chicago, 111., is a major producer of machinery and chemicals for industry and agriculture, with 1979 sales of $3.31 billion. Worldwide, the company has more than 45,000 employees located at 136 manufacturing facilities in 33 states in the United States and 14 other nations.